Hikaru x Haruhi. <3. HD Wallpaper and background images in the ouran high school host club club tagged: ouran high school host club haruhi hikaru. I totally think HaruhixHikaru is cuter, but I don't think Hikaru would leave his brother for a girl, no matter how cute. I actually think she looks right with Hikaru. Haurhi TOTALLY belongs with Hikaru! Let him be her boyfriend and tamaki can be the father figure like he wants! This pic is so cute! I'm cool with either it's Haruhi X Tamaki or Haruhi X Hikaru...they're both awesome guys, after all! i dn mind if she ends up with tamaki though!! i dun 1 hikaru to end up with her!!! Whats gonnna happen to kaoru then? N besides, Haruhi belongs to Tamaki!! i love hikaruXharuhi!even tho alot of people dont think so i think she looks good with kyouya too! it should always be HikaruXKaoru! they is so cutes! I dont know if its just me but i love sonadow too, so i think i just have a thing for gays... but im a straight fan girl! 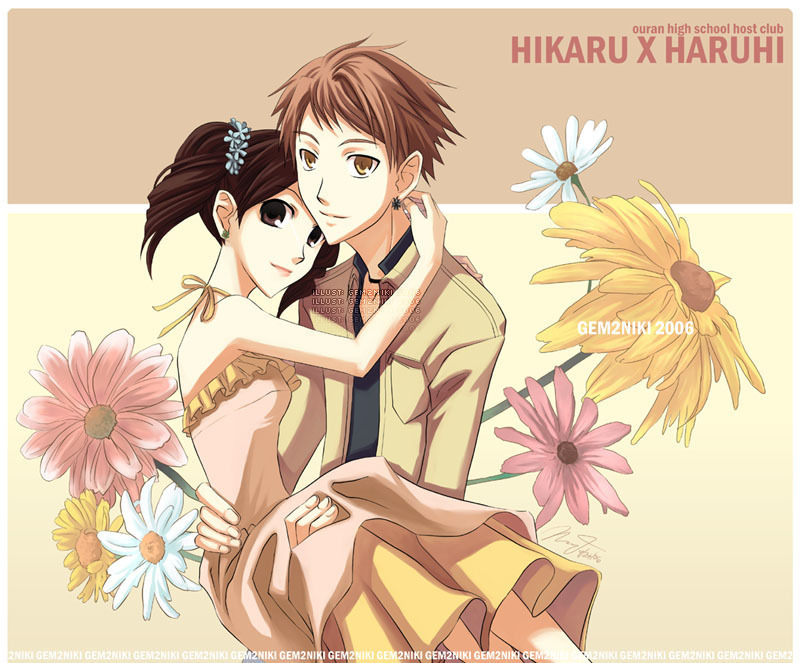 YEAH FOR HARUHI X HIKARU FANS!!! i really like this .. They look like a cute couple together!! Cute! But i wish Kaoru was in the relationship with them... 3SOME! By the Way! Tamaki is Spelt... well Tamaki not Tomaki Temaki or Tamaky! IDIOTS!